Reference to this article in the Charleston (SC) Post and Courier (see below) appeared in my email more than a month ago. I was completely taken aback. I was not sure how to respond despite having committed to the examination of all aspects of the “Just Like Family” phenomenon many years ago. In short, the 10-year-old Charleston Gospel Choir, a renown and respected mixed-race choral group, advertised a program called “Just Like Family: The Black Mother that Raised Me — A Story of Love, Loyalty and Devotion.” It was a mistake. The title, of course, refers to the story that has been told by white people raised by African American women for generations. Often the white children did in fact have intense love, loyalty and devotion for their caretaker. But the title was incomplete. Or rather it did not address the complexities and contradictions of this relationship or the point of view of the women who raised white children and the impact this relationship might have had on their own children or grandchildren. Nor does the title suggest an unpacking of the incongruous and paradoxical shared history of African American and white people. These relationships deeply affected the economic and social lives of many African American women as well as the white people they served. (I wonder if there are African American women working in Charleston homes today as caretakers of the white family. I bet there are.) After some very nasty responses, the choir changed the name of the program to “Women: Honoring Global Sisterhood”–a total re-framing of the original theme. After reading this article, I wonder if I run the risk with this blog of being completely ignored because of the title–Just Like Family. 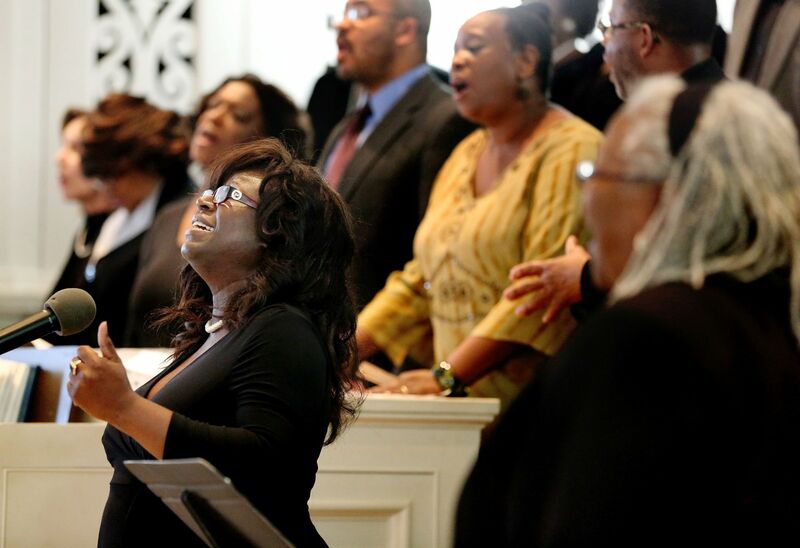 Although I agree that the title and theme of the choir program should have been changed, Charleston lost an opportunity to open up a conversation about the realities of a part of our history that is barely recognized. However, we can safely express our opinions about this history through this blog–one way to clarify and engage the feelings aroused by the subject. I hope you will read the article below and reply with your comments and perhaps suggest another name for this blog! When the Charleston Gospel Choir prepared a program called “Just Like Family: The Black Mother that Raised Me — A Story of Love, Loyalty and Devotion,” social media lit up with expressions of rage, followed by phone calls and emails, some littered with insults and threats, that rattled concert organizers and hosts. The firestorm was sparked by an African-American professor of journalism and communications at Morgan State University in Baltimore who saw the poster online and objected loudly on Facebook to what she perceived as the inappropriate glorification of “mammyism.” The poster included a photograph of a black nanny and two white children. Domestic servitude is a basic component of the African-American experience. During slavery times, planter families relied on a staff of black servants to manage affairs of the house. After emancipation, most jobs were off-limits to blacks, who had been denied the education to qualify for them as well as the opportunity to pursue them because of widespread discrimination. One of the few jobs a black woman could get from the late 1800s through the mid-1900s was that of a domestic servant — maid, cook or nanny. In the South and elsewhere, the black nanny helped raise white children, and often strong bonds of love and gratitude were formed. It can be an uncomfortable topic, but the historical record is clear. Consider Angela W. Williams’ 2015 memoir “Hush Now, Baby” in which the Mount Pleasant-based author recounts her relationship with Eva Aiken, who was “the central figure in my life” from infancy until marriage. Or read photographer Sally Mann’s 2015 memoir “Hold Still” in which the author shares the story of her relationship with Gee-Gee. White people too often have ignored or denied that these black caregivers have an inner life — emotions, preferences, concerns — so that the domestic servants have been reduced to caricatures, Patton said. And there was an inherent double-standard in all of this, she added. The children might have considered their black nanny “family,” and the nanny’s white employers might have considered her “part of the family,” but it was never permitted to be the other way around. The problem with the Gospel Choir’s concert was not the desire to examine the issue — Patton said she harbored no objections to such an investigation — but the way it was advertised, using that charged phrase and photograph. “Context and marketing matter,” she said. “How do you think people are going to interpret that?” The poster might reassure or comfort some white viewers hesitant to confront the difficult issue head-on; but for black viewers, the poster is a harsh reminder of injustice, Patton said. When she posted the image on her Facebook page, many of her followers had a visceral reaction, and she encouraged them to contact concert organizers and complain, she said. Pringle, a black man in charge of an integrated choir, insisted the concert was not to celebrate “Aunt Jemima” but to pay tribute to hard-working African-American women who persevered in the face of oppression and bigotry. Their children generally did better, and their grandchildren did better still. “Black women have gone from being domestics to some of the most powerful people in America,” he noted. That’s what happens when discrimination lessens over time. And the phenomenon of black servitude is hardly unique to the South, Pringle noted. “There’s a whole segment of white people in the North and the South who had black servants” — doormen, janitors, chauffeurs, repairmen, nannies, nurses. These black workers typically endured insults and indignities in the public square, but they were often treated with respect (albeit often paternalistic and condescending) by white people in their homes, Pringle said. Sometimes, genuine relationships developed. But the many critics of the concert were not interested in knowing any of this, he said. And after receiving a few threats, Pringle decided to scrap the theme and its planned narration, opting to redefine and retitle the event: “Women: Honoring Global Sisterhood.” The switch cost him nearly $4,000 in new posters, website changes, marketing efforts and more, he said. A new script was quickly put together by Karen Chandler, who will narrate the program. The Rev. Dr. Eric Childers, pastor of St. Matthew Lutheran Church, said the episode has been discouraging. The predominantly white St. Matthew Church is hosting the concert. For the past six years, it has gladly collaborated with the Charleston Gospel Choir, providing concert and rehearsal space, Childers said. You are currently browsing entries tagged with Stacey Patton at JUST LIKE FAMILY.